Here's a road hazard unique to Vermont. A delivery driver got his truck stuck while navigating his way through an East Fairfield covered bridge, according to Vermont State Police. Bridge Street near Route 36 was temporarily shut down last Thursday so Sticks & Stuff driver Michael Bevins could remove the 2007 Ford F-350, according to police. No one was injured; a Sticks & Stuff spokesman declined Seven Days' request for comment. About 10 homes are located on the south side of the covered bridge, which spans Black Creek, according to Fairfield town clerk Amanda Forbes. Drivers can steer clear of the very Vermont-y landmark by using Mill Street, she said. "He should have gone around to avoid the bridge," Forbes said of the wayward deliveryman. "It's not used as a main throughway." 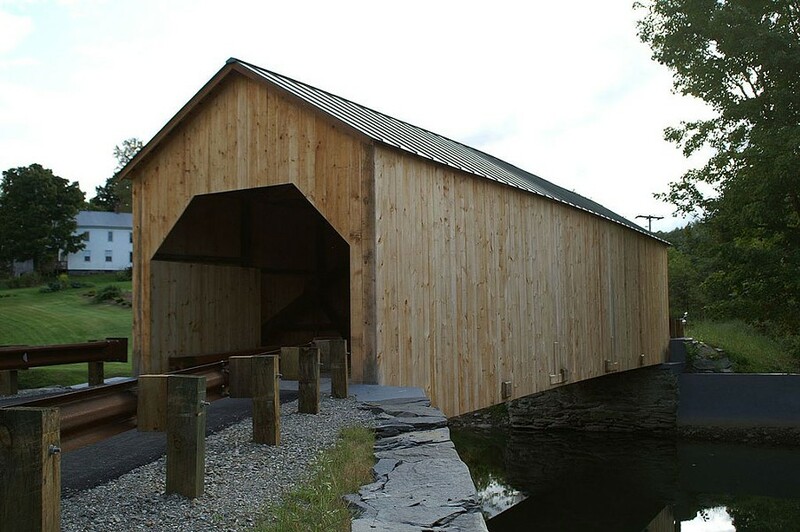 In fact, the bridge was closed to vehicles from 1987 until 2009, when it underwent a major renovation, according to the Vermont Covered Bridge Society. "Original fabric remaining in the bridge are chiefly in the trusses, floor beams and joists," the group wrote when the span reopened. "The bridge once featured several stenciled advertisements and some posters — few of these are retained." Built in 1865, the 68-foot queen post truss bridge is listed on the National Register of Historic Places, thanks in part to Vermont historian Hugh Henry, who wrote in his 1974 application: "The covered bridges of Vermont are among its most cherished and symbolic historic resources." Landmark lovers such as Henry can breathe a sigh of relief: The crash only knocked out some boards, but the bridge is still open, according to Forbes. The town is getting an estimate for repairs, she added. "There's not a lot of damage, so we're happy about that," Forbes said. The original print version of this article was headlined "A Bridge Too Narrow"